75th and Sedgwick: Ooh yeah. Woo-hoo! We got it at Housing Works. The ABC Carpet ticket was still on (good sign!) and says it retailed for $249.00. Housing Works wanted $40.00. I used a $20.00-for-$40.00 Groupon I purchased way back when. So yes, this rug is just shy of 4x6 and was $20.00. We laid the rug down very briefly for this little photo shoot, but now its all rolled up and waiting for us to take it to get professionally cleaned. Housing Works is great, but NYC street feet walking all over it are not! Not to mention who could have had this before us! On to less squeamish matters...we wanted something old looking, with a nice pattern and colors that related to the room. We have been looking and looking and honestly getting pretty frustrated with how expensive rugs can be. So this is a total score for us. To some, it might look a little small for the space but I am loving how it defines that little corner while still showing off a lot of floor and giving the room space to breathe. Also, Nick has taught me how to use the Wacom Tablet and um, I'm obsessed. So I thought I'd use it to show everyone what we have planned to finish off the space. Oh-la-la. Btw, get ready for a lot more (and hopefully more beautiful) doodling. And on a related note, check out this dorm room decorated with black tape. It is AWESOME. 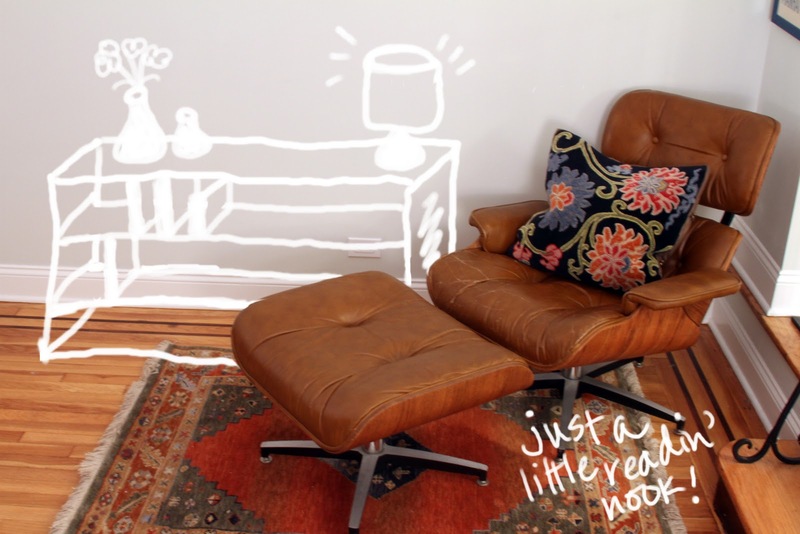 Purchase bookshelf for next to the "Eames" Lounger (something low and not too big...). Hang art over the couch (we're thinking huge Ribba frames framing blown up photography, like this). We've got some great shots for this from our Florida trip! Hang art around the desk (maybe a gallery wall?). 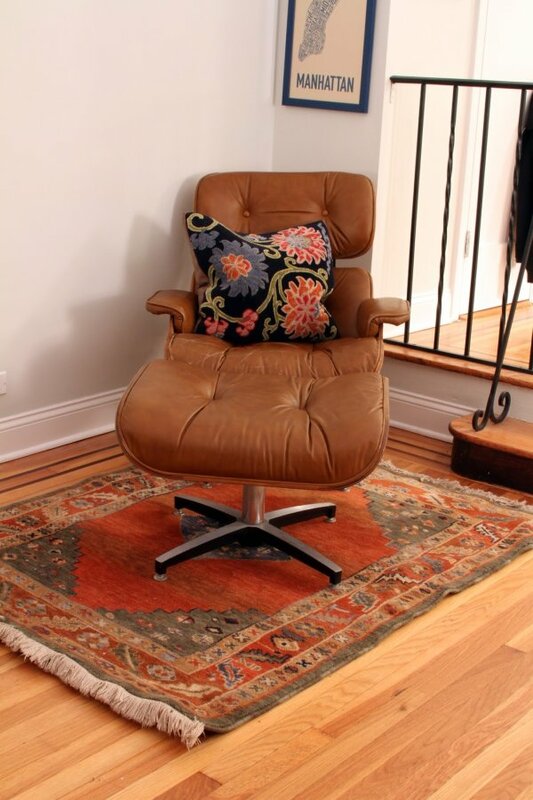 Purchase rug for under the "Eames" lounger (I gotta figure out proportion on this one, but overall thinking patterned, like this) . Plants. The room is beggin' for them. I need help, though! How do I keep house plants alive?! Curtains. I just ordered these. Now that my friend, is a good deal on curtains. Still working on the curtain rod, though. Blinds. I want to switch out those lovely apartment standards for something warmer and more polished. Artwork hung on either side of window (at least). I need the aforementioned curtains hung first to see what kind of wall space I'm workin' with. Purchase a new coffee table (we reeeeally don't like the clunky chunky trunk anymore, but aren't sure what's next). Purchase small end table next to the couch. If we have end tables on either side of the couch, maybe we don't need a coffee table at all! *Decided to veto this -- furniture overload.